Compressed air is commonly referred to as the 4th utility, which is why facility managers are concerned with the quality and moisture content of the air going into their plant. High levels of moisture (water and oil) can cause premature wear on tools, cylinders and valves as well as increase corrosion and bacteria/mold growth inside the piping network. Installing a compressed air dryer will drastically reduce the moisture content and eliminate these problems; however, selecting the correct dryer technology is important. 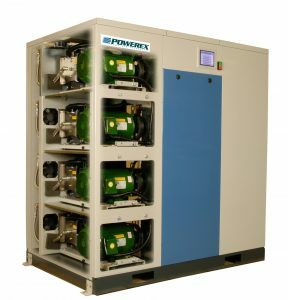 Refrigerated style compressed air dryers are common and operate similarly to an air conditioning unit by cooling the incoming compressed air, condensing water vapor into liquid and then removing through a separator with a drain valve. Refrigerated dryers are limited by temperature and cannot cool below 32°F (0*C), as the condensed liquid would freeze. 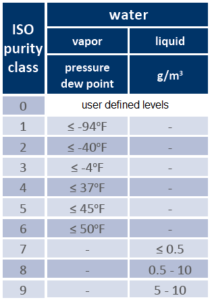 Pressure dew point is defined as the temperature at which water vapor condenses into a liquid at a given pressure. Based on this definition, a refrigerated dryer will deliver a pressure dew point range just above 32°F. As a reference, compressed air at 38°F pressure dew point and 100 psig pressure contains 609 ppm(w) of moisture. There are several different types of refrigerated dryers including non-cycling, cycling and variable speed dryers. Each technology refers to the operation of the refrigeration compressor. The compressor runs continuously in a non-cycling dryer, independent of the thermal load. Similar to your home refrigerator or air conditioning unit, a cycling dryer turns the refrigeration compressor on and off based on a varying system thermal load. Your home is the thermal mass for your air conditioning unit which allows the compressor to cycle on and off. Cycling compressed air dryers utilize a thermal mass such as silica or glycol to cycle the refrigeration compressor and a variable speed drive compressor increases or decreases the speed and subsequent capacity of the compressor relative to the compressed air consumption. To achieve a pressure dew point below 32°F, a different technology known as adsorption is required. Small beads or granules of desiccant material are extremely effective in removing moisture, similar to the small bags you might find in a new pair of shoes or jacket pocket. In the adsorption process, the desiccant media pulls the moisture out of the compressed air stream and holds it on the surface of the beads. Over time, the beads become saturated and require regeneration. During this phase of the process (commonly referred to r egeneration or desorption), a portion of the dried air from the online tower/vessel is used to flow through the saturated tower to remove the moisture. As a reference, compressed air at a -40°C/F pressure dew point and 100 psig pressure contains 10 ppm(w) moisture content and meets ISO 8573 class 2. The ISO 8573 group of international standards is used for the classification of compressed air purity. The standard provides the test methods and analytical techniques for each type of contaminant. The table to the left summarizes the maximum contaminant levels specified in ISO 8573.1: 2010 for the various compressed air quality classes. 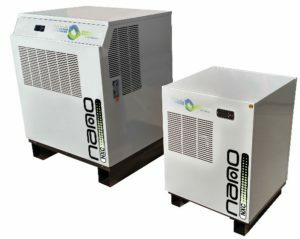 Nano R1-Series (NXC) thermal mass refrigerated dryers utilize a reliable, simple and energy-efficient stationary silica mass dryer design to achieve a 38°F pressure dew point (ISO Class 4 moisture vapor). 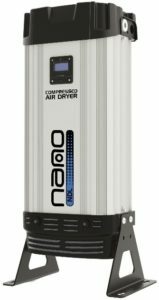 If you require a lower pressure dew point for high technology lab or process applications, the nano D-Series (NDL, NHL, NEX and NBP) utilize highly efficient desiccant and advanced controls to effectively remove moisture content down to a -40°C/F pressure dew point or lower (ISO Class 2/1 moisture vapor). Contact your local compressed air professional at Lewis Systems to find out which dryer technology is right for your specific application at your facility. Guest post written by: Mark Lauterwasser, Business Development Manager at nano purification solutions. For more information, visit www.n-psi.com. Check insulated areas and make sure the heat is staying inside and the cold is staying outside. Also check any weather stripping and replace areas that are worn out and not working properly. Check condensate drains throughout your system for proper operation. Excess water in your lines and freezing temperatures are not a good mix. Check your air intake openings to ensure they are adequately protected from increased rain and snow. 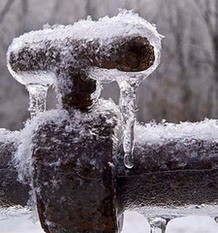 Contact us today if you need any help with addressing your cold weather vulnerabilities. Written by: Keith Seawell, Service Manager – Greensboro branch. Keith has been with Lewis Systems over 30 years. When hospitals and medical facilities need Medical Air compressed air systems, there are many factors to consider. First and foremost, all systems must meet the requirements set forth in the NFPA 99 specifications. Aside from the standards laid out by the NFPA 99, there are some other things to consider. 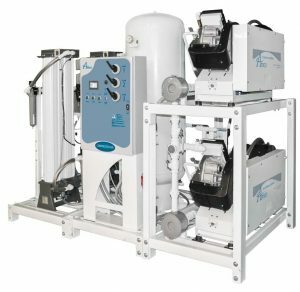 Compressor Technology: Different technologies can be used for compressed air in a medical system. Currently the most widely used is the oil-less reciprocating and the oil-less scroll. The oil-less scroll is a great choice because of its lower operating costs and extended service intervals. Having a smaller size, scroll pumps can be banked with multiple units, allowing the system to meet the varied demands of a hospital saving energy costs during periods of lower demand. Noise / Heat: Usually a compressed air system is not the only piece of equipment in the mechanical room. Excessive noise and heat can be issues. An enclosed scroll system can offer the advantages of reduced noise levels. Also with an enclosed system you can duct in your cooling air and duct out the hot exhaust air. 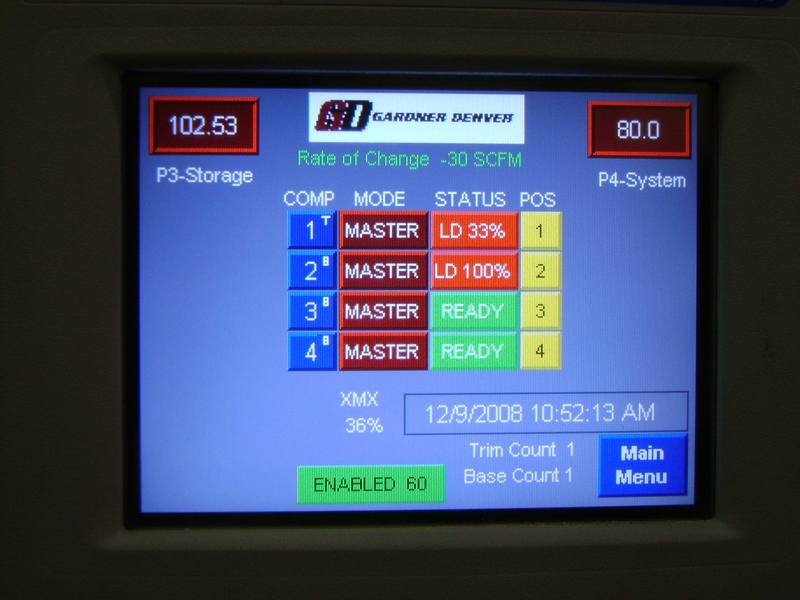 Controllers / Connectivity: An integral part of any Medical Air compressed air system is the controller. Things to consider would be Ethernet connectivity, integration with your building automation systems (BACnet Protocol) and email notification for service personnel. Reliability / Serviceability: Even with the stringent requirements from the NFPA 99, not all systems are built the same. Close attention needs to be paid to the expected reliability of the system and how it is engineered. Check the manufacturer’s warranty and see what is covered and for how long. Some manufacturers are submitting their systems to seismic testing and certification. We now have seismic certifications available for all of our source equipment. No matter how well a system is engineered and built, you’ll still need service for it so make sure there is local support with technicians that are ASSE 6040 certified. Written by Darren Brown: Medical Systems Consultant for Lewis Systems. Darren has over 30 years in the Med Gas and Oil-Free compressed air industry. Recently we looked at some of the benefits of switching to Oil-Free compressed air. Moving to an Oil-Free compressor can have a significant impact on your cost of ownership, but like most capital expenses, you’ve got to do your research before you buy. Let’s take a look at the Kobelco KNW Series and see what unique features set it apart from the competition. Heavy Duty Air End Design – a patented, high-efficiency super rotor profile. Rotors, shafts and compression housing all have a PTFE coating to protect against corrosion and wear. Thrust balance pistons on each stage provide maximum air end life. These are not found on competitive models. 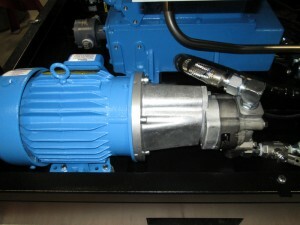 Pre and Post Lubrication of Gears & Bearings – an independent motor-driven gear pump provides lubrication prior to start up, during operation and shutdown. 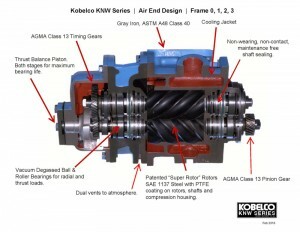 A unique feature of the Kobelco KNW Series that increases gear and bearing life. Heavy Duty Input Bull Gear – input bull gear is supported on each side along with a labyrinth type seal used on the drive end. Competitors use an overhung design as well as lip seals, which are prone to wear and leakage. The KNW design ensures a long operating life and eliminates oil leaks. If you’re looking for a quality oil free brand, Kobelco KNW should be at the top of your list. Learn more about the KNW series here. The way compressed air is made has not changed for many years. The oil flooded rotary screw is by far the most popular method and is the industry’s standard today. What has changed is the technology and improvements in rotor design, compressor controls, motor efficiency and variable speed drives. Most plants are running the same compressors they purchased 15 to 20 years ago and most are running more horse power than they need. Even though your compressors are doing a great job and are very reliable, there are ways to make them run more efficiently. The first step is to have your compressed air system evaluated. A Level I evaluation consists of a job site visit and a walk through of your compressor room and plant. This is done free of charge. Helpful recommendations can sometimes be made from this evaluation. We are looking for the following: How are your compressors operating? Load/No Load or Modulation control. Do you have enough air storage capacity? Is your air piping adequate? Will a master controller or a flow control valve work for your plant? Would a variable speed compressor work best? All these items are addressed during the visit. If we feel it’s necessary, we will recommend a Level II air study or energy air audit. This study will determine exactly how much cubic feet per minute (cfm) your plant is using. 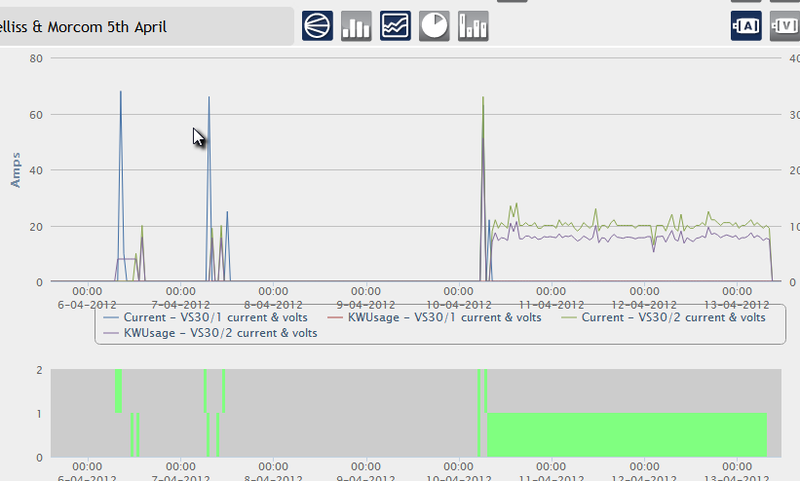 Our data loggers will be installed and take readings every 12 seconds for one week. 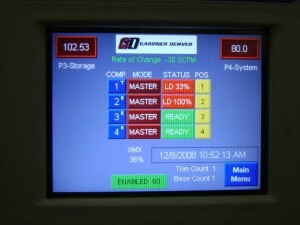 We are measuring and logging flow (cfm), k/W (compressor amps), and plant pressure (psig). 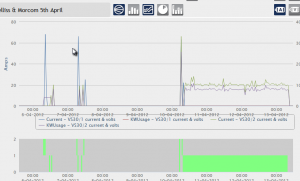 From this we can determine how efficiently your compressors are operating and how energy efficient we can make your plant operate after our recommendations are implemented. A return on investment (ROI) is also determined. Your air compressors are one of the greatest energy users in your plant. If you can cut the cost of producing compressed air by 15% to 20%, you can see significant savings in overall costs. To get started, contact your local branch and request a Level I evaluation today. Lewis Systems & Service Co., Inc. strives to deliver innovative and cost effective solutions for our customers. With products and technologies continually advancing, it can be difficult to keep up with the latest trends and developments. Our desire is to discuss the technical aspects of our products and services, helping you gain a better understanding of these new technologies and the benefits they can deliver.